Say “No!” to January blues. Say “Yes” to tropical XC paradise. Take off from manicured grassy launches surrounded by coffee and banana plantations. Milk generous and bountiful thermals to climb high and travel far across tropical landscapes. Land next to papaya trees and sugar cane plantations, to be welcomed by friendly locals on horseback. Your two week Colombian Safari is fully supported with two drivers and THREE top guides to help you get the very most from your adventure of a lifetime. Expect to clock up plenty of airtime here. Fly XC every day in conditions are generally smooth and easy. Two retrieve buses using the latest live-tracking technology means you’ll be back to launch (or the pool) faster than ever. This is XC flying at its best. With our trip you’ll also get to see plenty of tropical Colombia – staying in 5 different (and good quality!) hotels as we travel through Colombia visiting some absolutely fabulous XC sites. Bring your camera! This trip is open to autonomous pilots qualified to at least CP level. Pilots should also have some previous thermalling experience and ideally have been XC before. Most of the launches we visit (about 8 different ones!) are really ideal – the perfect grassy slope. Conditions on launch are usually strong enough for reverse launching, but forward launches are also often required. With Passion you’ll ALWAYS have a guide on launch to help you. Whilst the launches are some of the most accessible and manicured you’ll find anywhere, landings are often more challenging and not always so big. If you have any doubt about whether your flying abilities are sufficient, please get in touch. The aim of this trip is to develop pilot XC skills by scoring as much quality airtime as possible and enhancing that experience with quality air-to-air guiding, group and individual feedback. The second of our 3 trips is reserved for serious XC hounds. If in doubt about your suitability please contact us via email. Colombia is hot and humid. Climbing up to base is refreshing and you’ll be flying in shorts and T-shirt (maybe a jacket on high base days). Temperatures on landing can be very hot and humid. At most of the sites we visit winds are generally light and valley breezes are not a problem. The humid air means that thermals are well behaved, easy to understand and not too strong. It also means that thermals are usually marked by nice fluffy cumuli. Climb. Fly to fluffy white cloud. Repeat. Expect to considerably develop your XC skills on this trip. No matter what your level we are there to help. One guide is always last to launch so always there to assist. We will be flying with you – most probably splitting into smaller groups so you can get the most out of the experience. This will mean less experienced pilots can expect to get feedback on their thermalling skills whilst more ambitious and experienced pilots will not be hindered from covering bigger distances or more ambitious flights. As well as full weather and task briefings each morning, we’ll take time at the end of each day to give you feedback to help you improve your flying skills and XC decision making. It’s all there for you but there’s no pressure. More than a paragliding course this is a lifetime adventure where flying and having fun in a tropical wonderland is what it’s all about. We’ll spend the first flying day at Sopetrán before moving south to fly the sites of Titiribí, Jericó, Pantanillo, Cordoncillo and La Merced. 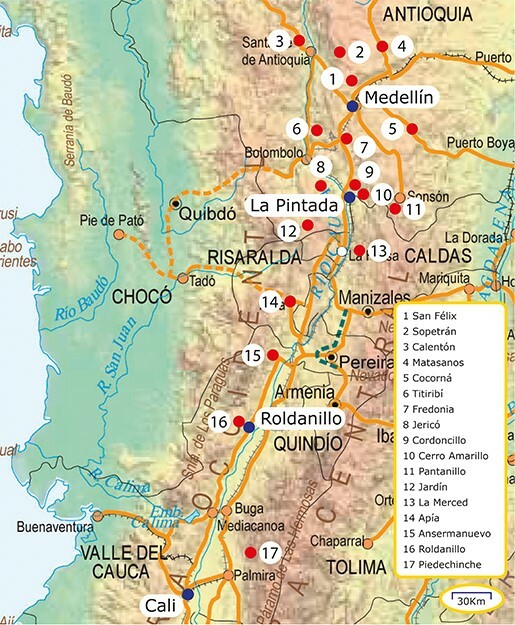 During the second week we’ll fly the Cauca valley sites of Ansermanuevo, Roldanillo, Apia and finally Piedechinche. We’ll spend three days in Piedechinche – the ideal warm-up site no matter what your level – plentiful land-out options and lots of flat land XC potential. For the second half of the first week we’ll head north to fly the other Cauca valley sites of Ansermanuevo, Roldanillo and Apia. In the second week we’ll meander our way deeper into the Andes Mountains to fly the other-worldly XC sites of Cordoncillo, Pantanillo and Jericó, before finally arriving in the stunning Andean city of Medellin. We usually stay very close to launches so with the odd free morning we’ll visit coffee plantations (and a few other secret surprises!) We use local guides so you get an unparalleled insight into the local culture. We use a variety of accommodations along route. In rural Colombia, accommodation can be a bit basic, but all places we stay are a notch-up from other operators. You’ll even have a pool for all but a couple of days from your trip. Prices for the fortnight are based on twin rooms (two people sharing) (double rooms for couples). If you’d prefer a single room for the week, these are sometimes available for a supplement. Please get in touch early to reserve a single room. Breakfast is included in the price. We’ll usually pick up flying snacks (lunch) en route to our flying site each morning. In the evenings we usually organise ourselves to eat at a local restaurant – making everything easy for you! Sunscreen and sunglasses – It will hot and sunny ! Hat – It will hot and sunny ! Warm clothing – you won’t need much of this and nothing too fluffy, but occasionally we stay quite high in the Andes Mountains, so a fleece or light jacket could be useful. Camera – Great photos are assured! Waterproof jacket – Colombia is tropical and the odd down-burst is to be expected. Most international flights arrive at El Dorado International Airport in Bogota. You will therefore usually need to organise short domestic flights to and from Medellín and Cali. If you’d like to arrive a day or two early, please let us know if you need help with accommodation. Please wait for your booking to be accepted before booking flights. Airport transfers are all included. We’ll meet you at the airport at the beginning of your trip and drop you back there at the end. Citizens of most European countries and the US do not normally require a visa for visits to Colombia for stays of up to 90 days. You might need to provide proof of onwards travel (e.g. return flight ticket). Please check visa requirements well in advance. Your routine vaccinations should be up-to-date. These usually include diphtheria, tetanus and polio. Travel clinics will also usually recommend Hepatitis A and Typhoid. Whilst we will be travelling in an area that is low risk for many diseases compared to many parts of the country, please be sure to consult your doctor several months BEFORE your trip for professional medical advice. Sun-cream and a hat are recommended! The local currency is the Peso. The easiest (and probably cheapest) way to get cash is by using the ATMs in all the small towns we wander through. We require you to have insurance that covers repatriation. Please make sure that your insurance is valid for Colombia and of course that paragliding is covered! Please bring insurance documents with you. You will not be allowed to fly without proof of insurance!! You must bring all you flying documents with you, including your flying licence and your paragliding insurance documents. Most sites in Colombia incur fees. 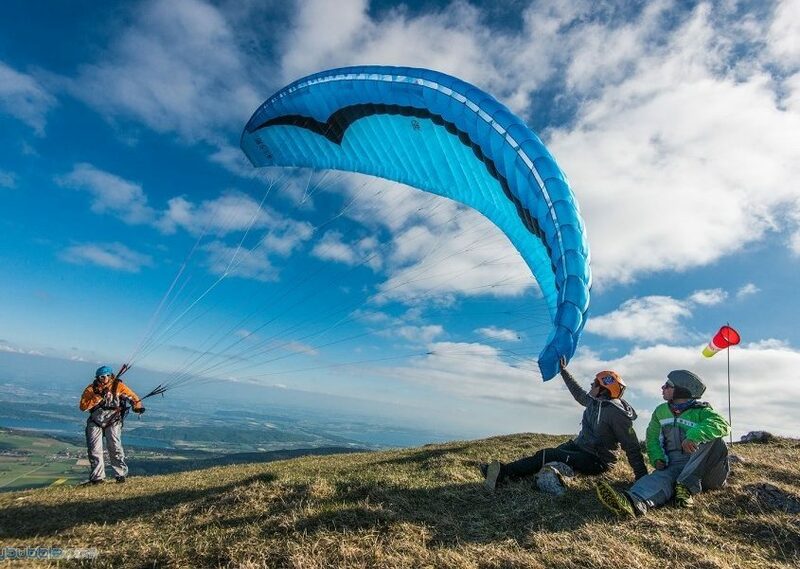 These fees are covered by Passion Paragliding and included in the cost of this trip. If ever it’s not flyable here, there’s plenty to do. We’ll be there to help where we can. There’s a very high chance of it being flyable every day. If you feel tired from all the flying why not take a break? Flying is always safer when well rested. As with all our cross country trips, we’ll be using live-trackers for your safety. These are included in the cost of the trip and they’ll also help with some optional post-flight analysis, so if you want to learn and improve your XC skills and decision making you’ve got the perfect set-up. Shortly before your trip we’ll send you an updated set of way-points and on arrival you’ll receive a flying map. Hotel accommodation with hearty breakfast. Full guiding service with top guides: THREE top guides to fly with you including world record pilot Toby Colombé. Airport Transfers (Medellin / Cali). All transport for the 15 days. Retrieve transport no matter how far you fly. Live tracking – you’ll be provided with a tracker for each flight. All site fees for the duration of the trip. When comparing trips, please recognise what’s included. We include a lot more than other operators! We look after all the small details so you get to concentrate on what’s important: flying and having fun. Not included are return flights to Colombia; insurance and vaccinations; drinks and meals. The previous 3 trips [to Colombia] with [another operator] have always been rather trying with an odd mix of very competitive pilots which lead to a disjointed group with little harmony. I would always recommend Passion Paragliding. I have been on many flying trips to many flying sites in many countries over the years and none have been as well thought out, efficiently organised, planned and coordinated as this recent trip to Colombia with Passion Paragliding. Everything was extremely well organised – the flying, retrieve system, accommodation, food. There wasn’t a thing for us to worry about except flying well. It was just a fabulous flying holiday! To apply for a place on this trip, just click the button below and select your preferred week. Please also write a line or two about your XC experience in the comments box.